About four months ago I ordered some books from Amazon to be delivered to Medellin. Normally I read fiction to relax but on occasion sprinkle in some non-fiction. I saw the title and cover of Sugar Crush and then looked at a 1-2 paragraph synopsis. It sort of intrigued me and I ordered it. I cannot remember what caught my attention but I think it was the word, inflammation. I started to read Sugar Crush about three months ago and it got my interest really piqued in regards to chronic inflammation. My undergrad was in Chemical Engineering and Business so the chemistry part was easy to follow. And by the time finished, Sugar Crush convinced me that sugar and bad carbs did more than just make you fat and cause diabetes. It was clear that it may be the root cause of many other things but I was not sure what. Coincidentally a week after I finished reading Sugar Crush, I met the wife of a new employee. Rasa is Iranian but MD trained in Canada and now a holistic MD here in Colombia combining acupuncture and other related Eastern medicine practices. I told her about my edema in my feet and ankles that has been gradually getting worse over the past several years. I told her my doctors thought it was blood pressure related and I started on some blood pressure meds. And I was trying Lasix to no avail. 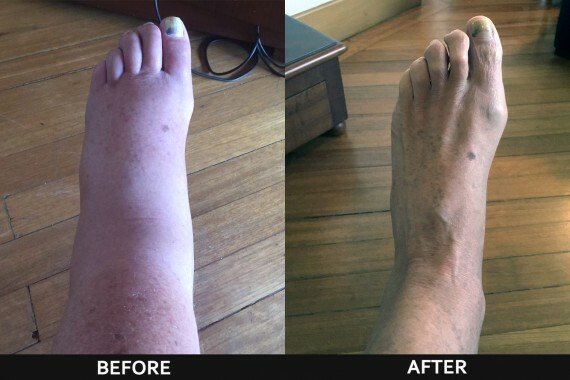 The second blood pressure meds got my pressure down to normal but the edema persisted, see first photo. Every morning I would awake and my feet were normal. An hour later they would look like [the BEFORE] photo below. And of course then I was noting some occasional tingling or numbness and having visions from Sugar Crush of your flying down and cutting off my feet, LOL. Disclaimer: These are Rich’s actual photos, sent to us to share. Your results may vary. So Dr. Rasa suggested I do a Detox – Hypoallergenic_Dietary_Guidelines. 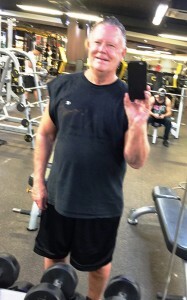 Being a heavy drinker for 55 years and never taking a break since 30 days on the wagon in 1969, I said what the heck. No more sugar, diet drinks, coffee, carbs or alcohol. Days 3-6 I was a little lightheaded and weak. I cut two weight workouts down from two hours to one hour. But I did see some reductions in my swelling by day 7 and by day nine it was totally gone and has stayed that way. Then the good news started piling on. 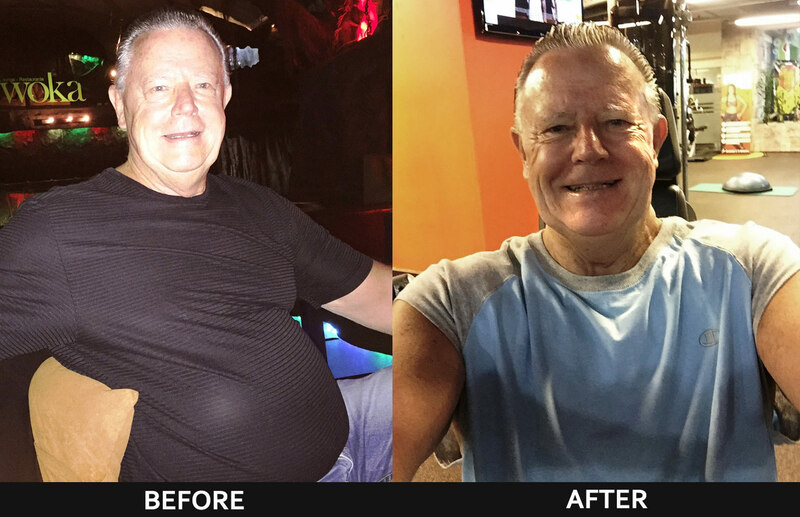 For the past several years I have been having increasing back pain in my lower back in spite of my weight workouts. My doc says I have some inflammation in my L4 or some other lumbar area. Well that went away, like 95%. My acid reflux which would act up 1-2 times per week went away. My energy and strength went up to the point I am speed walking 6 miles on Sundays and now after my two hour weight workouts I could keep going. My shortness of breath going up hills at the Medellin altitude improved 50% (could be the 15 lbs. I have lost?). And my blood pressure readings were going down to 120/65 so I quit my meds two weeks ago. I am staying in the 125/130 over 70-75 area and I now am off of all meds for the first time in five years although I am now taking fish oil and CQ 10. What really excites me is two months ago I was thinking at age 72 my quality years of life are gone and I would be doing the downhill struggle as I sign off this earth. But now I feel, God willing, I may have 20-25 good quality years left. No more sleeping eight hours and waking up tired with no energy. No more aches and pains and feeling like an old fart. And all of this because of /&·$&/()”? )&/% SUGAR. 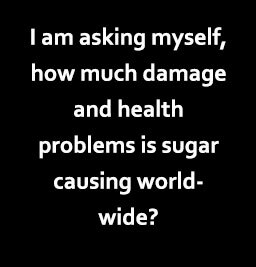 So now I am asking myself, how much damage and health problems is sugar causing worldwide? Is this like the Big Tobacco cover up from 60 years ago but on a scale 20 times bigger. How many trillions of dollars are at stake with Big Agra, the corn industry, soft drink industry, fast food industry, food processing industry, breakfast cereals, Big Pharma, the AMA, the news media who do not want to tell the truth about sugar because they do not want to lose 30-40% of their add revenues, the lobbyists who are paid by the aforementioned to keep legislatures around the word from not enacting legislation and education telling their constituents the truth about sugar? I will be dedicated for my remaining years to helping expose this colossal scam that has its roots in money and power. I keep thinking now about the US especially which is leading the way for the world to show what happens in their sugar fueled diets and lifestyles. How in one swift stroke if they did what I did, we might reduce health costs in the US, perhaps 50%, or more. Think how that would help our 142 trillion dollar unfunded debt. A great step forward. And how it would help all the kids with their ADD, hyper active, Ritalin fueled lifestyles. I would bet my net worth those kids would be helped if you took the sugar and bad carbs out of their diets. Michael told me you are not joining in with some of your colleagues who discover health insights but give up the fight because they accept speaking fees, research grants, honorariums, bribes, threats from the power interests. But you are plugging ahead with educating and telling the truth. Congratulations for your integrity. Also one other surprising thing, and I stress this when I am preaching now, is I did not diet and I did not weigh myself. I ate the hell out of salmon, fish, chicken, eggs, fruits and vegetables. I was never hungry, not once. It is actually easy especially when you do not have those empty carbs creating cravings for more empty carbs. You can see some of my photos of three – four months ago and today. People have commented on both my weight and my complexion being better. I just carved two new notches on my belts so my pants do not fall off. I have a brand new wardrobe of shirts I have not worn in several years. My energy is through the roof, all at age 72. Sorry about the rambling but you can see that I feel so blessed to be able to add quality years to my life with something so simple. 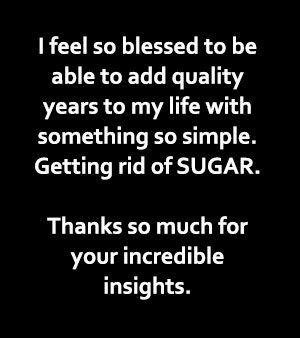 Getting rid of SUGAR. Thanks so much for your incredible insights. 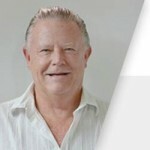 Rich Holman, Founder and Partner of First American Realty Medellin, visited every major continent except Africa, finally settling in Medellin, as “the best city I have ever visited or lived in.” He started FARM to fill a void in the real estate market in Medellin, “to take care of all the foreigners when they discover Medellin and want to buy an apartment”.